The Door and Window Alarm with Deactivation Key is an effective alarm that protects your doors or windows. When a door or window is opened, an alarm will sound alerting you. The Door and Window Alarm with Deactivation Key is an effective alarm that protects your doors or windows. When a door or window is opened, an alarm will sound alerting you. This unique model can only be turned off with the deactivation key. This simple device can be used around the home to alert you to unauthorized entry (or exit). It can also protect cupboards, cabinets, even drawers where you want to make sure a child isn't getting into or going where they shouldn't. The 105 decibel alarm lets you know that a door or a window has been opened. Use these wherever you want additional security such as on all ground floor openings. Our brilliant customers have also found another use for this particular safety device. TIP: Super Glue the battery compartment shut so it can't be disabled. Have a problem with an adolescence leaving when they aren't supposed to? As parents, all too often we feel like we have absolutely no control over what our teenagers do. They have reached that age where they feel they deserve their freedom and they will get it one way or another - even if they have to sneak out of the house. Are your children guilty of sneaking out of their bedroom window? Have they even braved the front door? What can you do to prevent your teen from sneaking out? Having a talking to hasn't worked, and not even being grounded seems to help. Maybe for a week or two…but then, there they go again. Expressing concern for their safety is of no effect. The consequences are worth the fun. Unfortunately, short of installing security bars on your windows, and pad-locking all the doors, there’s not a whole lot you can do to keep them from sneaking out at night. Is a Window Alarm Right for You? There are many inexpensive door and window alarms on the market today. The problem with most of these alarms is that they are meant to sound off when someone is entering the house. They have on/off switches and are too easy for your teenager to just turn them off before slipping out. When they return, they can just turn them back on again. All the while, you are "left in the dark". There is an alarm solution to this ever-growing problem. A Door and Window Alarm with a dectivation key. 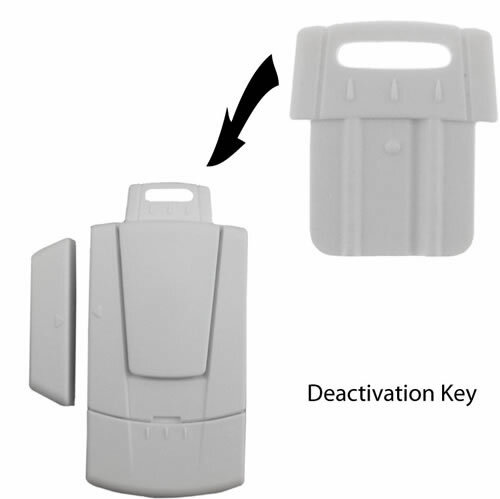 Because this wireless alarm is self contained, you are able to arm and disarm the unit with the key. The inexpensive price comes in handy when you need to cover several windows and doors that are being used for a swift escape. The Door/Window Alarm with Deactivation Key installs quickly and cleanly without any drilling or wiring. Just install the main unit and the magnetic bar on the frame of the door or window, using the powerful adhesive tape. When the door or window is opened, the alarm will emit an intense 105dB siren. This is a very economical way to keep someone out of someplace you don't want them to be, or alert you of their presence. Batteries are included. Alarm triggered after entry opening and/or window opening. The Door or Window Alarm can be placed virtually anywhere extra security is needed; around the house, in your boat or RV, in a dorm room, or garage, the security possibilities are endless!